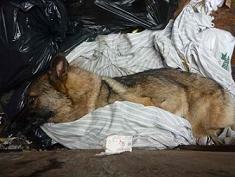 On July 18th, 2012 Captain a 2 year old German Shepherd dog was discovered wrapped in a bloody sheet in a Vancouver, British Columbia dumpster. Captain was found suffering from serious wounds, brutally beaten, emaciated and neglected. He was deemed a quadriplegic by the time he was recused. He passed away from a heart attack shortly after being rescued despite the great efforts of the SPCA. I am tired of hearing about animals who are abused while their abusers walk free. I would greatly appreciate it if you could take the time to sign this petition to help bring tougher laws to protect animals and ensure the abuser is held responsible. There is also a fundraiser going on to raise money for the BC SPCA’s animal cruelty division. The money from the fundraiser helps prosecute animal abusers and provides emergency care and helps nurse abused animals back to good health. The campaign ends on at Aug 18 at 11:59PM PT. You do not have to donate money but you can take a second and sign the petition to help stop animal cruelty.